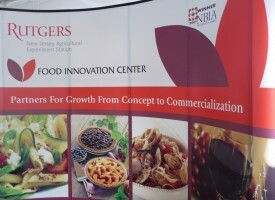 Share the post "FIC to Lead Feasibility Study with City of Paterson to Create Food Business Incubation Program"
The Rutgers Food Innovation Center (FIC) has been awarded a contract from the Paterson Restoration Corporation (PRC) to lead a feasibility study on creating a food business incubation program in Paterson, NJ. The grant to Rutgers was for $70,000, with funding to the PRC by the U.S. Economic Development Administration. The PRC and FIC will hold informational meetings on Feb. 23 for startup entrepreneurs and established food businesses, in order to gather community input into the planning process at the Hamilton Club of Passaic County Community College, located at 32 Church Street, Paterson. The feasibility study will identify the needs of the local community as well as assess the requirements of converting an industrial building located at 163-177 Pennsylvania Avenue into a food business incubation program. The City of Paterson will use the results of the FIC study to determine the feasibility and process for moving forward with the project, and will be armed with the organizational requirements, as well as the capital and operating costs that will be needed at the potential food incubation facility. “We’re really excited about the possibility of a FDA-inspected commercial kitchen and food processing facility being located in Paterson, out of which food businesses in the region will be able to design, develop and commercialize their specialty products,” added Cooperhouse. The Paterson Restoration Corporation and FIC have scheduled the Feb. 23 meeting to both inform and solicit input from potential food business entrepreneurs and community members from Paterson and throughout the region, regarding potential opportunities of the incubator program.